Heres the perfect Bible for people that prefer the classic KJV, in a feature-packed edition that wont break the budget. It fits comfortably into the hand with a one inch wide spine and has clear, large type. Commuters, students, and those looking for a special gift will benefit from having this Bible. Stylish, two-tone flexisoft bindings enhance the value of this volume as a special gift. 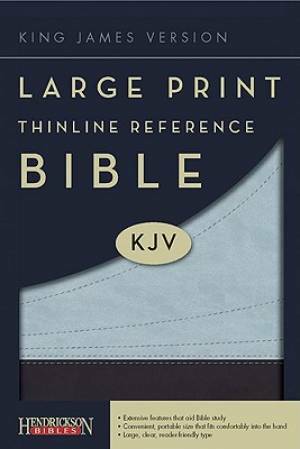 KJV Large Print Thinline Reference Bible Blue Imitation Leather by Hendrickson was published by Hendrickson in May 2010 and is our 31534th best seller. The ISBN for KJV Large Print Thinline Reference Bible Blue Imitation Leather is 9781598568455. Be the first to review KJV Large Print Thinline Reference Bible Blue Imitation Leather! Got a question? No problem! Just click here to ask us about KJV Large Print Thinline Reference Bible Blue Imitation Leather.